In the days when I was printing Edwin Smith’s negatives for Olive Cook, his widow, she would sometimes give me copies of his original prints as gifts. This was always a great honour, as she was extremely protective of the work he left behind, particularly any prints he had made himself. This is one example, which I received sometime in the early 1990’s. Although given to me framed, I never hung it as the makeshift mount was one made for a landscape print and this was portrait format, so it didn’t look right at all. The frame was also old and battered, so recently I took it apart to cut a new mount and re-frame. I had no idea where the photograph was taken until I got it out of the frame. 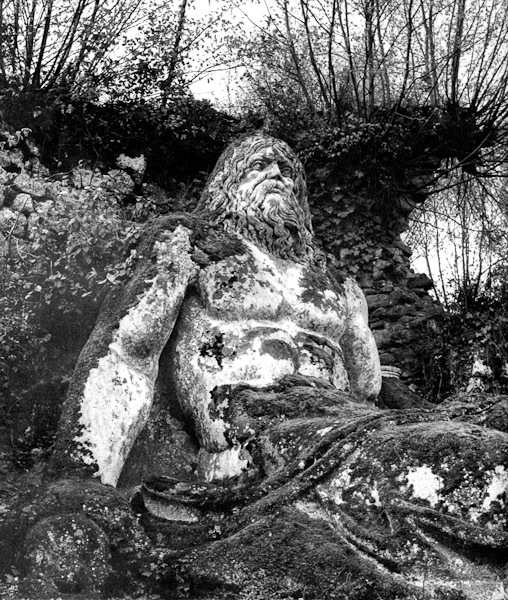 It turns out to be one from a series taken at a garden in Bomarzo, Italy. This garden, constructed in the 16th century, contains some quite remarkable and fantastic sculptures, of which this is one. The park was designed by the architect Pirro Ligorio for Prince Pier Francesco Orsini, known as Vicino Orsini, in 1547-1552. It was called a ‘Sacred Grove’ (Sacro Bosco) by its creator. Reverse of Edwin Smith print, showing severe staining. The print turned out to be in a bit of state; the image surface exhibiting small yellow stains and the back – well, you can see this for yourself here. This is very representative of the quality of a print made by Smith himself. 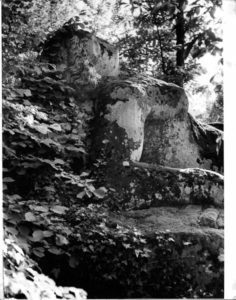 Using a darkroom without running water and with quite primitive equipment and facilitites, it is hardly surprising that many of his prints ended up like this. 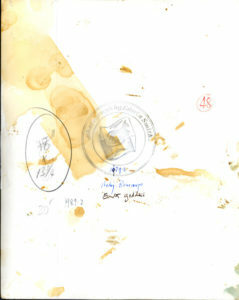 The stains are unlikely to be removed by re-washing the print and doing so may well destroy the ink annotations, so I decided to leave it to decay gracefully. The markings are interesting in that they show that this print was, at some point, proposed for enlargement, presumably for exhibition. All the writing on the reverse appears to be in Smith’s own hand; the negative reference number, 1989.2 (not a date), a proposed size, crossed out, with a second, larger dimension given. The customary Edwin Smith linocut stamp has been applied at the same time that an identifying location was written (in blue ink). At some later date the title ‘Earth Goddess’ has been added in black ink, by Smith, so any consideration of use must have happened before his death in 1971. It is not known what the red ’48’ signifies, but possibly the position in a series of prints? Lying River God, Bomarzo, Italy, by Edwin Smith. From ‘The Wonders of Italy’. The Edwin Smith archive held by RIBA and catalogued in RIBAPIX shows a series of images taken by Smith at Bomarzo. These contemporary pictures are dated between 1960 and 1963, and it is known that Smith and Cook lived in Italy for a time during this period. 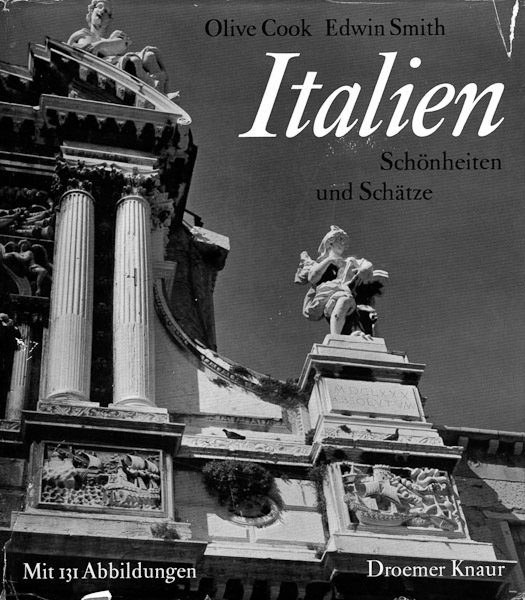 The sumptuous Thames & Hudson publication The Wonders of Italy (1965) resulted from their time there. The plates for this book, printed in photogravure by the French company Braun et Cie, were personally supervised by Smith during their production. Robert Elwall, in ‘Evocations of Place: The Photography of Edwin Smith ‘, describes the book as “…an exemplary marriage of fine photography and fine reproduction”. 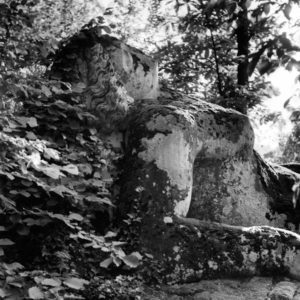 The Wonders of Italy contains one image from the Sacro Bosco, shown above, which is probably the partner of the one I own as it appears to be taken in the same vicinity. It is undoubtedly the stronger picture of the two, hence its choice for the book no doubt. The dust jacket of ‘Italien’, the German edition of ‘The Wonders of Italy’. My copy of ‘Wonders’ has the text in German and was published in 1967, two years after the English edition. It was published by Droemersche Verlagsanstalt TH.KNAUR NACHF. – GMBH & CO., who are still around today, but still used the fine photogravure printing of Braun et Cie in France, at the same size, 27cm x 31cm. The quality of the reproductions are so good that they no doubt matched Edwin’s prints exactly. They are the equal of any matt photographic print and are good enough to frame as ‘originals’ (as if such vandalistic thing could ever be considered!). The entire original print, showing the burned out highlight lower left. The actual print that is the subject of this post is by no means a perfect one. Shown on the leftin its entirety, the image is considerably ‘burned out’ on the lower left corner. Probably taken by Smith on his Ross Ensign Autorange camera, it maybe just be a work print, although the annotations on the back suggests it was once considered for reproduction. Having developed a kind of rapport with his negatives from handling them for so long, I would guess that he left the bottom corner underexposed in the print as he knew that it would be cropped if used. In framing the print anew, I took the decision to crop it in the mount as shown in the version that heads this article. I like to think Edwin Smith would have been happy with the decision. Exploring the history and provenance of this photograph as far as is possible from the sources I have available to me has been an interesting experience. Learning of the existence of the Sacro Bosco is another reason to visit Italy one day.